on the Snake River Help Salmon? Probably not. Removing these dams and re-establishing normal fish runs will take almost 25 years, completed long after the critical time necessary to help salmon and other fish. More immediate actions, for much less money, could happen in time to really make a difference. As a result of a recent ruling by a federal judge, the U.S. Army Corps of Engineers (Corps), the Bureau of Reclamation (Reclamation) and the Bonneville Power Administration (BPA) are once again discussing the radical step of taking out four hydroelectric dams on the Lower Snake River in Washington State in an attempt to help salmon runs on the Columbia River system. These four dams include Ice Harbor, Lower Monumental, Little Goose and Lower Granite Dams. These dams were built for navigation of barge and various river traffic, for low-carbon hydroelectric power, for irrigation and for flood control. Three days before Thanksgiving, about 300 people congregated in Pasco, Washington with representatives of these three agencies to discuss the possibility, and the consequences, of removing these four dams. Many more meetings around the Pacific Northwest have occurred, or will occur, before January 17, 2017, after which these agencies will analyze the comments and develop a reasonable range of alternatives for long-term dam operations. The range of alternatives will be formally analyzed in an Environmental Impact Statement that is expected to be completed in 2021. It will take several years to review and decide upon a course of action. Although no one really knows how long and how costly it would be if breaching these dams is selected, based on smaller dam removals it will take about 5 years each to plan, breach and decommission the four dams, and re-establish the natural flow of the river. And cost over a billion dollars. Thus, nothing would happen to help salmon for decades. And that's assuming everything goes well technically, and there is no protracted legal battles and other actions, which seem to be lining up already. As is the case for many of these complicated issues, the farther you live from these dams, the more popular is the case for breaching. The people in the region generally want these dams left in place. Fish passage improvements over the years have brought fish survival rates through these four dams up to very high levels, over 90%. The number of adult fish returning from the ocean is higher now than in the 1990s when serious tracking began. Recent drought and high summer water temperatures have hurt, but those are not a result of these dams. Dams can actually help survival rates by controlling water flows and water temperatures during stressful times. Benefits for salmon and Orcas from removing these four dams are largely theoretical. But benefits can come about much more quickly, and for less money, by better habitat improvements, reclaiming estuary environments that are so critical for Orca and salmon survival, predation management, harvest management, and more advanced fish passages and barging, especially using recent technological and management advancements. As an example, significant new fish passage improvements have recently been installed on the Lower Granite Dam. These include a permanent adult fish ladder water cooling system plus a Juvenile Bypass System upgrade. The former will remove the "thermal barriers" that develop along bypass systems that stop adults from migrating upwards into warm water. The latter includes "daylighting" juvenile fish passage by reconfiguring the juvenile transportation channel to a large elevated bypass flume leading to the Juvenile Fish Facility just downstream of the dam, plus other related fish bypass improvements. According to Dave McDonald, a long-time City Planner in nearby Pasco, improving conditions in the Salish Sea, the home of the Orcas, would be much better for Orcas than breaching these dams. Big dams must be decommissioned carefully in stages in order to allow the sediments to be slowly eroded, hoping that most will not migrate downstream for decades. An excellent discussion of dam removal can be found at the U.S. Forest Service website and by Gordon Grant. We have never decommissioned dams this large. Smaller dams have taken years from administration to completion. For the Savage Rapids Dam on the Rogue River in Oregon, actual removal began in 2006 and was completed in 2009, but it took almost 20 years to get approval. A third of the dam was left in place since it is exceptionally difficult to remove the whole dam and not have dangerously high levels of silt and toxic components entrained downstream that will kill fish and invertebrates. And Savage Dam was built entirely for irrigation purposes, and did not provide any flood control, hydroelectric power, navigation, or other beneficial uses, and is tiny compared to the Snake River dams. The region's growing rail and trucking system could probably handle the transportation function of the Snake River dams, but the use of these dams for navigation is still the cheapest and lowest carbon method for transporting goods. Eastern Washington has been experiencing an agricultural boom unlike anywhere in the United States. Washington State is even set to overtake California in wine production by 2020. The irrigation provided by these dams is a critical part of this boom. Ten million tons of commercial cargo and nearly 67 million bushels of wheat are transported on the Columbia/Snake River annually, an essential part of the region's economic competitiveness. But it's the power generation of these dams that gives us an environmental conundrum. Which is more important - salmon or carbon emissions? The timing is critical since we have failed to meet any of the emissions goals we have set for the world. Both needs must be addressed in the next several years, not 25 years from now when taking out these dams, and re-establishing the river flow, would be completed. 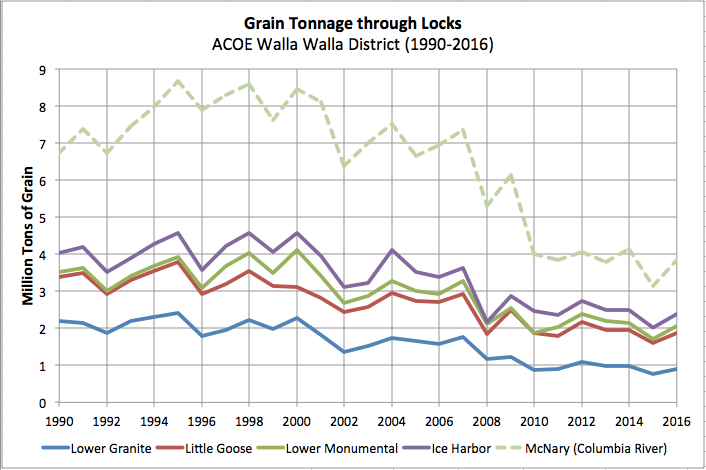 Ice Harbor Dam produces 1.7 billion kWhs/yr, Lower Monumental 2.3 billion kWhs/yr, Little Goose 2.2 billion kWhs/yr and Lower Granite 2.3 billion kWhs/yr, which total about 4% of the State's electricity generation. And it is all very low carbon, especially since these dams are in an arid region and methane production from the flooded area is negligible. The Bonneville Power Administration says it would replace these Lower Snake River dams with two modern gas turbines. Such a replacement would cost an additional $274 million to $372 million each year, and would increase carbon emissions by almost 3 million tons per year. Taking out large hydroelectric dams is a complicated, long-term, costly prospect that impacts a large number of people and issues. Just sounding like a good thing to do is not enough. James Conca is a geochemist, an RDD expert, a planetary geologist and professional speaker. Will Removing Large Dams On The Snake River Help Salmon?